Instagram is no longer a social network to share just selfies and food pictures. In fact, Instagram now has 500 million active users and has grown over 25% in just a year’s time. Instagram presents a unique opportunity to visually represent your brand, celebrate its personality, and keep it fresh for all users who scroll through their Instagram feeds every single day. 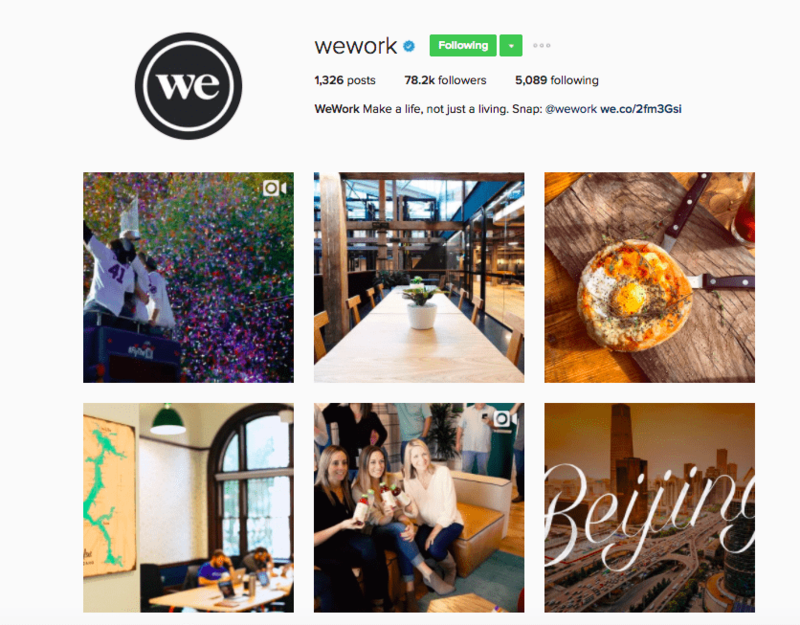 With the introduction of Instagram Stories, the photo-sharing social network now allows brands to tell engaging stories about their product, service, or work culture to their followers. Here’s a list of 10 brands on Instagram who should serve as an inspiration to your own Instagram content strategy. Headspace is a popular guided meditation app that is helping millions of people across the world practice and master mindfulness meditation. 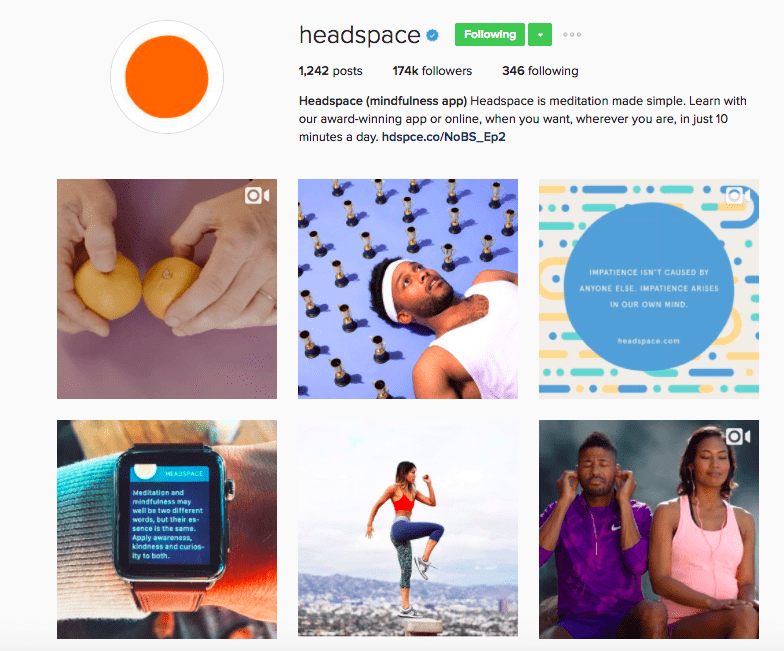 Headspace’s Instagram feed features tips, tricks, and reminders for practicing meditation. In addition to these, Headspace also posts mindfulness challenges to help people practice mindfulness in their day-to-day activities. 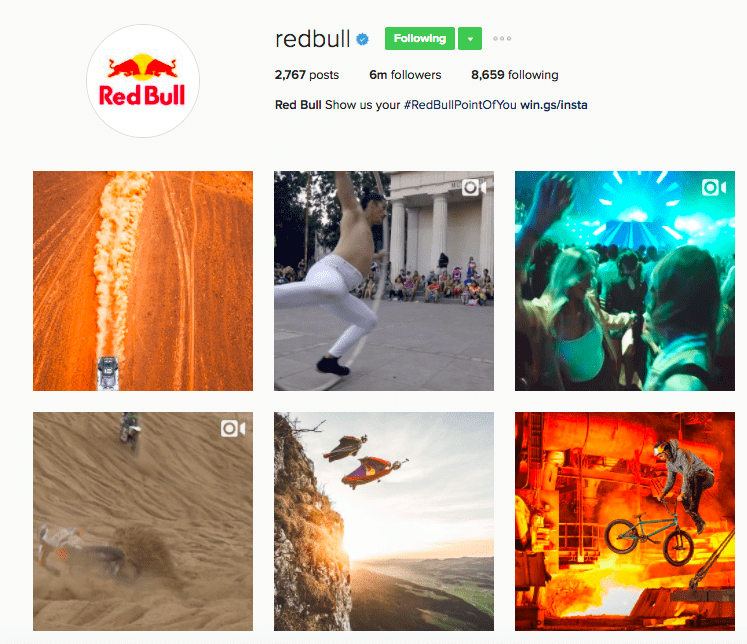 The energy drink brand has an active presence on all the popular social media platforms. So Instagram is no exception. The company shares images of extreme sports and adventures with their followers on Instagram. 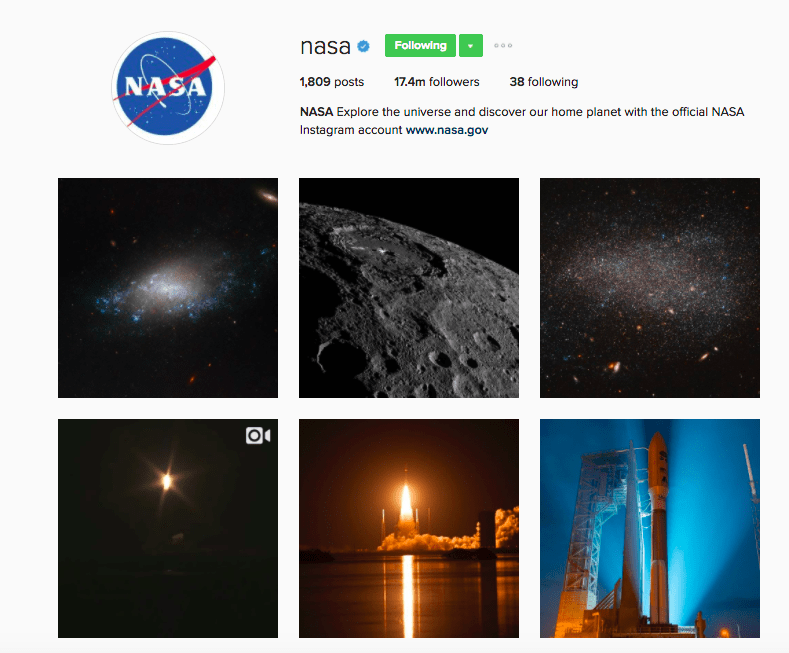 If you love space, then NASA is a must-follow Instagram account. NASA shares stunning photographs which feature everything from astronaut selfies to images of Earth seen from space. 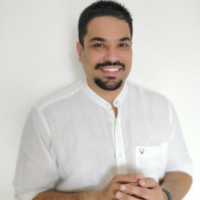 To add to their astonishing Instagram feed, they also make optimum use of Instagram’s latest feature, Instagram Stories, to tell a deep story behind each Instagram post. WeWork is in the business of providing shared working spaces to entrepreneurs, small business owners, and freelancers all around the world. So it makes sense that they post images showcasing their beautiful shared workspaces. 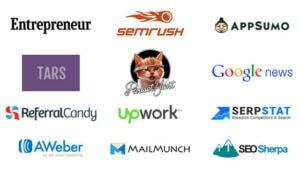 Along with this, they share images of their biggest events, including WeWork Summer Camp. They also encourage their customers to share images of their workspace accompanied with a hashtag of their slogan – ‘Do what you love’ and contribute their popular #DogsofWeWork hashtag. 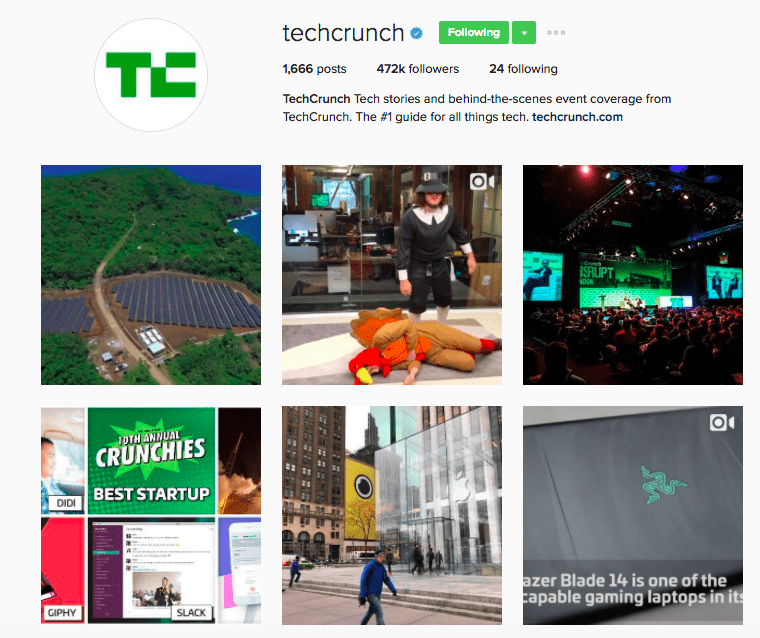 TechCrunch is the best brand to follow on Instagram if you’d like to stay up-to-date with all the tech news. What makes this account special is they often share behind-the-scenes images and stories from tech events which they cover. 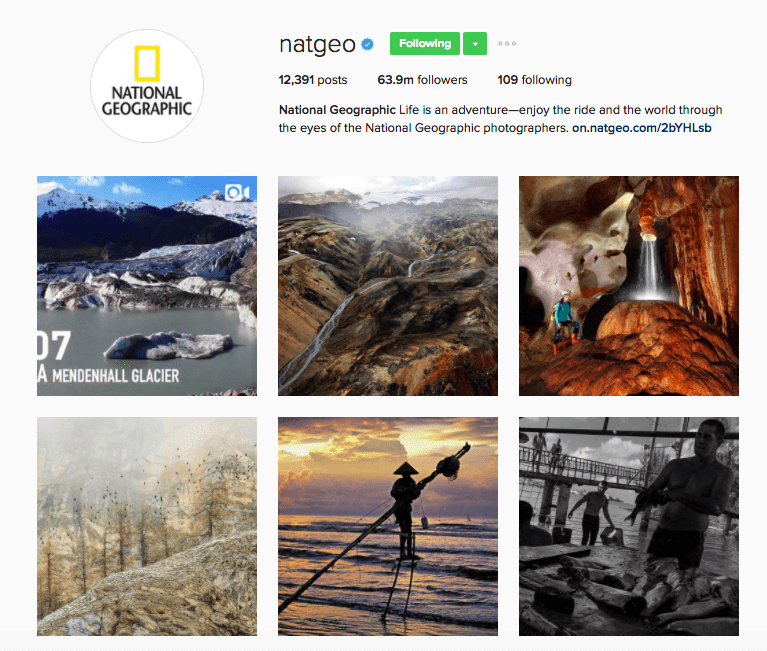 With a following of over 60 million followers, National Geographic is one of the top Instagram brands. Their Instagram account includes posts from contributors who travel all around the world to share some of the most breathtaking photos you can find on the web. An impressive feat considering National Geographic is still primarily a print magazine. 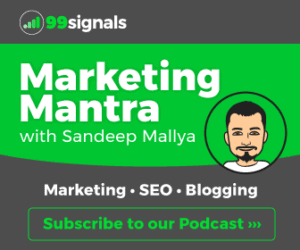 Buffer is a popular social media marketing, scheduling and analytics app which has a major presence on all social networks, including Instagram. Not only do they leverage Instagram’s new feature, Instagram Stories, to create interesting snippets of latest social media news and trivia, but also encourage users to share images of their workspace using the hashtag #BufferCommunity. 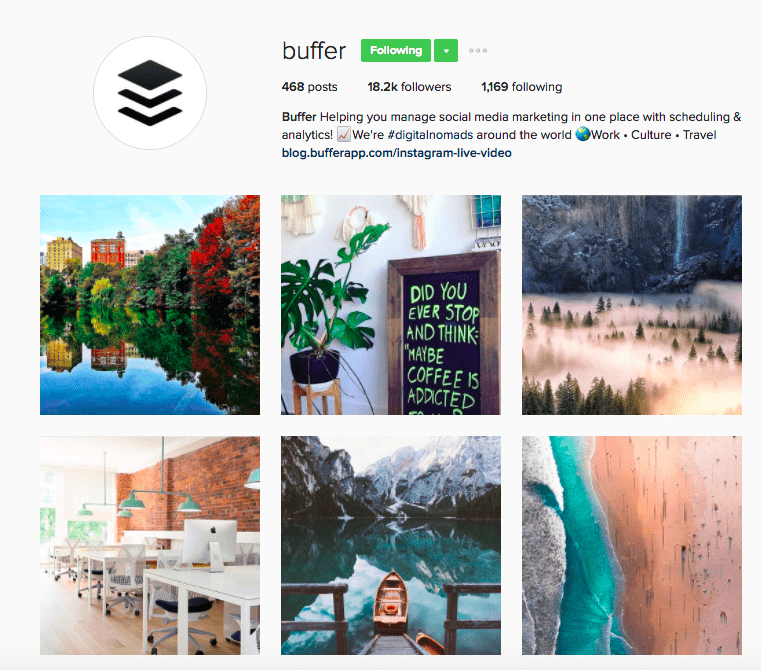 Buffer is one of the best examples of a brand that’s benefiting immensely from User Generated Content (UGC). If you’re going on an epic adventure, you’d probably want to include your GoPro camera in your travel kit. 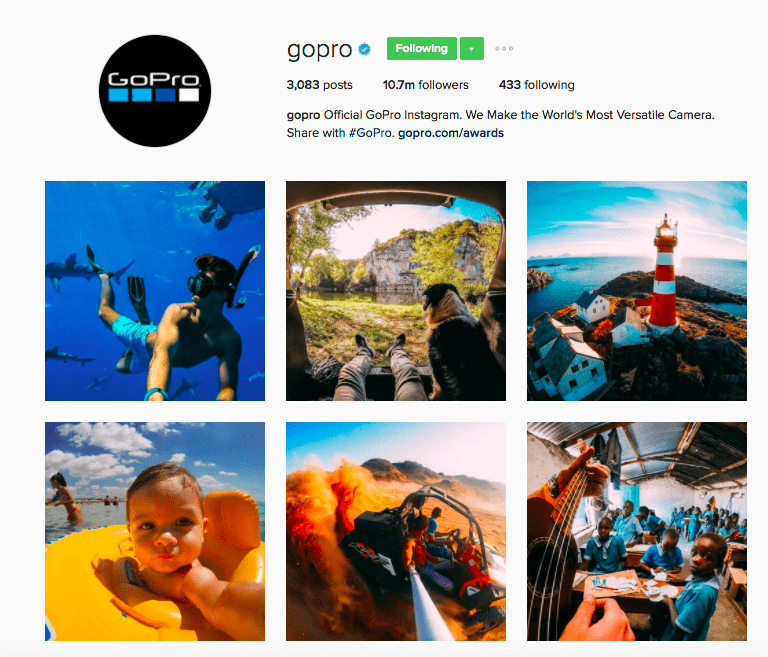 As such, GoPro’s Instagram feed features images from all kinds of adventurous environments, staying true to their reputation as the ‘World’s Most Versatile Camera’. 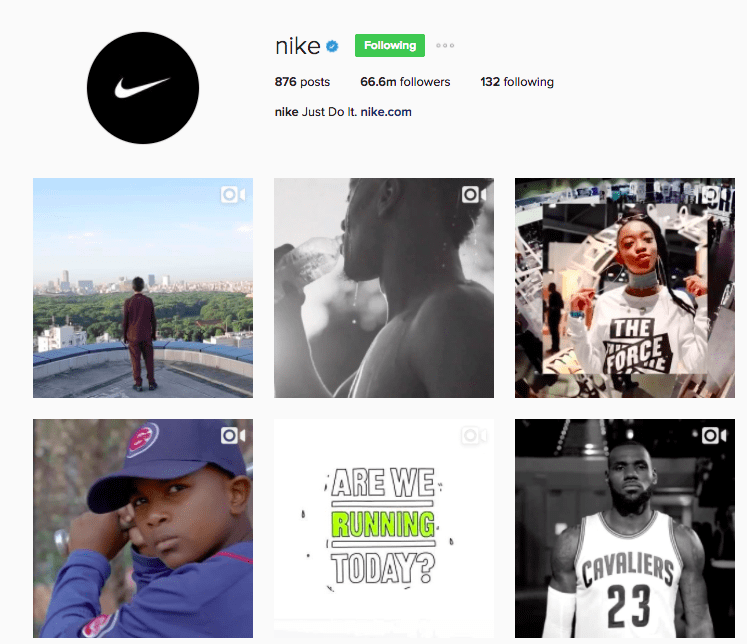 Nike’s Instagram account has more followers than any other fashion brand on the photo-sharing social network. Their Instagram feed features ad campaign images/videos and inspirational athlete stories that resonate really well with their followers. 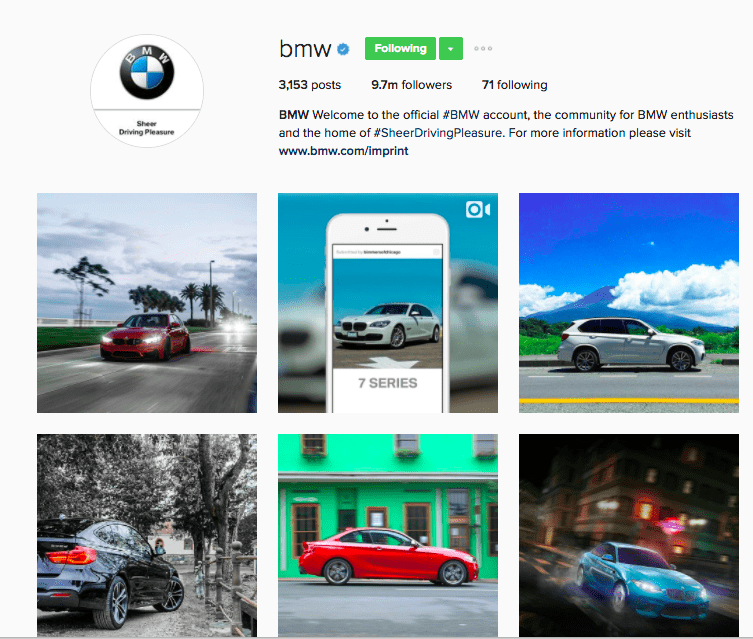 BMW has a solid social media presence across all the popular platforms (even Google+) and their Instagram account is no exception. BMW’s Instagram feed features images of their automobiles in different locations, oftentimes in stunning backdrops to make the followers personally relate and imagine themselves behind the wheel. Which brands on Instagram are your favorite? Let us know in the comments section. [Quiz] Can You Guess the Meaning of these #Hashtags? I have joined instagram recently. I was not aware of brands on instagram. I will follow some accounts like: Nasa, Red Bull etc.